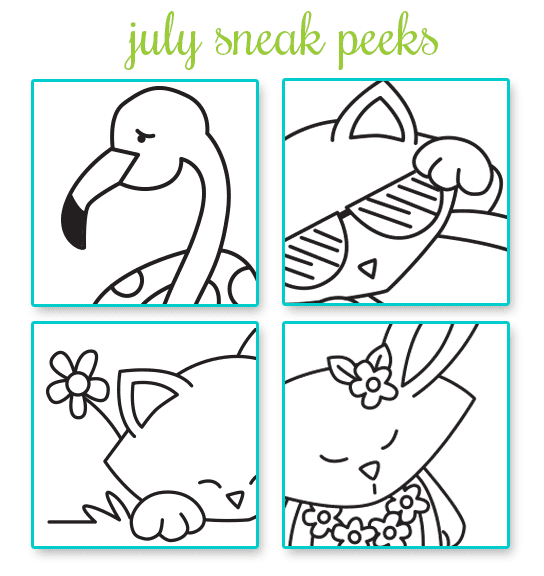 Newton's Nook Designs: Newton's Nook Designs - July Stamp Release SNEAK PEEKS! Newton's Nook Designs - July Stamp Release SNEAK PEEKS! Since we opened our "doors" (really, our website) - one year ago in July we have a VERY SPECIAL release planned for this month - We will be releasing FOUR new stamp sets - with lots of fun prizes and some special guests on Friday! Full reveals will be Monday through Thursday (one full reveal each day) and will be filled with fabulous summer fun from our NEW Design Team! THEN - on FRIDAY, JULY 18 we will be having a SUPER SPECIAL blog hop to celebrate our ONE-YEAR ANNIVERSARY in business! You won't want to miss it!! These 4 sets will be for sale in the online shop on Friday, July 18th! Make sure you pop through all the blogs and leave comments both days for a chance to win! It's going to be such a fun week! Any guesses as to what our themes are for these sets? Newton goes tropical! Oh, I can't wait to see (and buy) these! So excited to see this release! The sneak peek definitely got my attention. Very summery! I love the flamingo!! Yay! I can't wait! I see a flamingo! I'm having surgery on Monday. Hopefully I'll feel well enough to at least check Friday's post. Can't wait to see the full release! Your stamps are so much fun! Newton goes to Nantucket (or maybe Fiji, but it doesn't sound as good...). Congrats on your anniversary--wishing many more productive years in business! HAPPY ONE YEAR ANNIVERSARY!!! Here's to many, many more!